So, you know from the Join Us page that we have fortnightly training sessions and you will have got a very good idea of the types and quantity of shows that we attend from our Events page, but you may be asking yourself what other opportunities are accessible to Weorod members? What do we do the rest of the time? Are we sociable? How do we learn, and how to we keep that knowledge current? 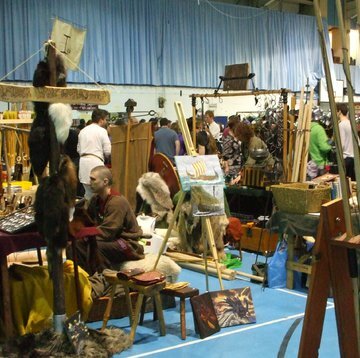 Always on the lookout for traditional materials, we attend a number of specialist historical markets and fayres throughout the year. These are really useful places to learn about different objects and styles in various periods of history. We can watch how technology and fashions change and develop through time, learning how to recognise those items that are appropriate for our own period. In addition to good quality materials we can also find ideas and inspiration at these events, whether it be a new variation on an old material, or a particular method of presentation, these events can be a really constructive day out. Often travelling some distance to attend them, our 'road-trips' are seen by our members very much as a social and enjoyable aspect of membership. So much more than just a shopping trip! During each year we will also offer trips to historical sites and museums. These visits enable our membership to contextualize their research, to see extant evidence from local cemeteries and to compare artefacts from further afield. The opportunity to see original archaeological finds 'in the flesh' and to study competent reconstructions has no parallels for us. 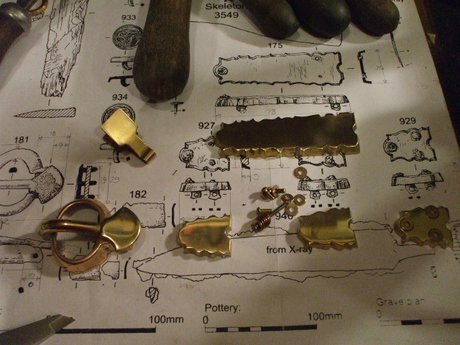 Sometimes the available reports cannot do justice to the fineness of the workmanship produced by our ancestors, and seeing a 'real' artefact up close can truly open our minds to the skills and artistry of the time. 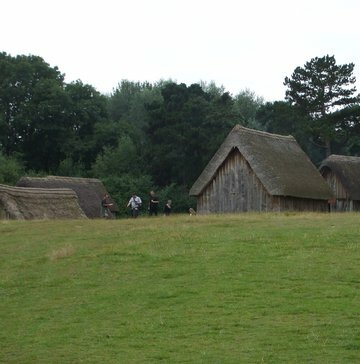 This photograph was taken during such a weekend visit to Sutton Hoo and West Stow Anglo-Saxon Village in Suffolk. From time to time we also have the opportunity to expand our understanding and learn about the history and archaeology of our area on a more practical level. Some of our team are also members of the Hampshire Field Club and this link can offer opportunities for specialist talks that keep us up to the minute with local research and excavations; and also the occasional opportunity for a site visit. The photograph here was taken at one such visit to the Anglo-Saxon cemetery at Barrow Clump - part of the excellent Operation Nightingale project. A number of our members attended a special tour organised by the Field Club - we learned a lot and had a really good day together. We all make as much of our own Kit as possible, with support from other members, and this affords us endless opportunities for testing out our skills, (patience!) and theories. We are increasingly experimenting with a wide variety of different period crafts in order to replicate grave finds from the local area. The photograph shows a replica of a buckle from St Marys Stadium, Southampton that one of our members has produced. On a larger scale, when our members want to try their hand at a new craft, for curiosity or fun, we often make a day of it and organise a workshop (or play-day!) to give everyone the opportunity to experiment in a supportive environment. 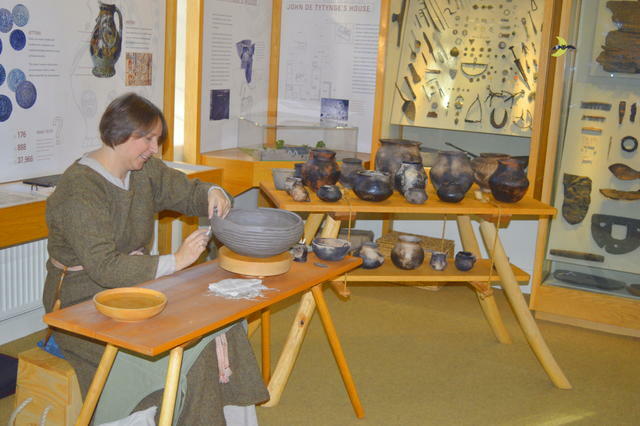 Workshops may include leather-crafts, weaving on a warp-weighted loom, natural dyeing, basketry, pottery - or many more. We are only limited by imagination and available evidence! The photograph shows some of the results from our pottery workshops. Oh, and there is the Yule Feast each year - undeniably more sociable than educational (? ), but we did promise both! You may well have spotted the comradeship that is evident in many of these activities, we are a friendly bunch and are very open to new-comers joining in the fun. None of these extra-curricular pastimes are obligatory, we only want people to take part in those endeavours that interest them - but as with anything else in life you will get out what you put in. There is a lot to get out of membership of Weorod - but do be prepared to join in and contribute something in exchange - that's what makes it work! If any of these ideas and activities inspire you and you wish to find out more about membership, please pop us an e-mail and we will send you more details and perhaps arrange to meet up for a chat.